The Lakeland Collection by Acme Furniture offers stylish and functional reversible adjustable sofa w/storage and ottoman. 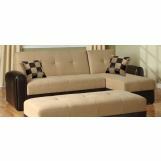 Enjoy this unique ultra modern reversible adjustable sofa with storage in your room. Chaise/sofa sleeper combines comfort with functionality and design. 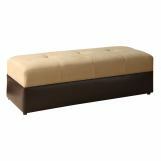 The sofa and chase provide ample space for storing items and easily converts into a sleeper. This sectional sofa is upholstered in sand microfiber and espresso PU for contrasting stylish look and comes with two accent pillows with checkered pattern. And simple, straight, square shapes give this Lakeland Collection a very clean and modern feel.